The Literary Athenaeum, Arts and Sciences, of Puerto Real together with the Editorial University of Seville, present this Thursday March 21 from eight o'clock in the afternoon at the Cultural Center of the San José Church, a publication that collects part of the works that the sevillian historian Antonio Muro Orejón, carried out on the Villa, under the name of 'Puerto Real in the modern centuries'. 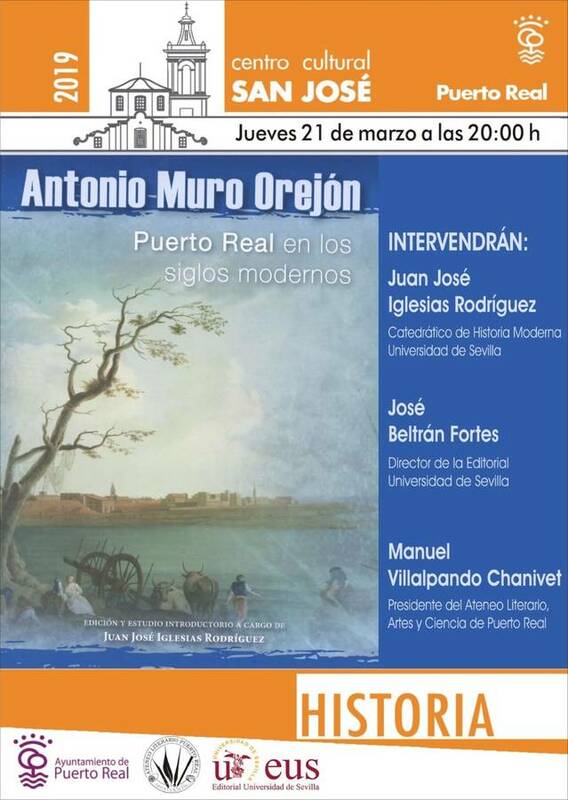 A project directed by the Professor of Modern History at the University of Seville, the Puerto Rican, Juan José Iglesias, also a member of the ateneísta entity. Together with Iglesias himself, the director of the publishing house that publishes this work, José Beltrán and the president of the local cultural collective, Manuel Villalpando, will participate in this event. With this initiative, it is pursued, as Juan José Iglesias means, a double objective. On the one hand, honoring and recognizing the figure of Antonio Muro on the 25th anniversary of his death that occurred in the spring of 1994. As well as, making his work known to new generations who "are unaware of age work and magnitude of the works of Don Antonio Muro on Puerto Real, so it is a way to perpetuate his memory. " In addition to the transcription and selection of the work, the person in charge of the edition incorporates in this book an introductory study, in which an "academic profile" has been drawn about the historian born in Seville in the year 1904, in which it is broken down the intense research work that he developed during his life. In the same, its role of "great defender and promoter of the cultural and heritage value of Puerto Real" stands out. Similarly, Iglesias explains that in this publication has taken the work concerning the Modern Age, XV-XVIII centuries, starting with the one dedicated to the founding of the Villa by the Catholic Monarchs. On the other hand, in this book lies the close bond and love of Antonio Muro to Puerto Real, an idyll that the city knew how to match him by naming him an adopted son as well as granting him the gold medal of the city that he donated to the Virgin of La Soledad , which he carries during his penitential parade during Holy Week. In addition, his name was given to a street and one of the institutes of the town. Also, the local historian, apostille that "perhaps his works were not very extensive, since he was a very concise person, but they do have a great value because they have served as a starting point so that others could later deepen more about the history of Port Royal". Finally, Juan José Iglesias, recognizes that this book has also been "emotional" as it tells that "I had the opportunity to meet Mr. Antonio Muro personally when I started as an investigator and I remember seeing him in the Municipal Archive " Later, he adds that "I also agreed as a professor at the University of Seville, in which the already retired was continuing to teach doctoral courses, I did not miss the opportunity to attend one of them on American Sevilla, of which I keep a pleasant memory , so that with this work I wanted to pay tribute to what was his figure and the work he did for the culture of Puerto Real ".